Just got my copy! 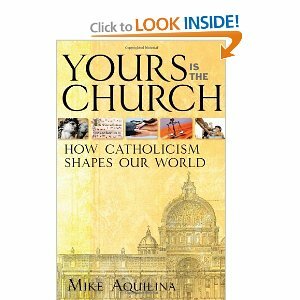 Yours is the Church by Mike Aquilina is a work of art! Here's what I had to say about it: "Leave it to Mike Aquilina to skillfully dust off 2,000 years of Church history and make it come alive! Through intriguing topics, the author accurately illustrates how the Church has shaped humanity. 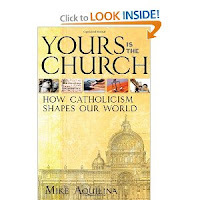 This is THE book to learn about the Catholic Church--and in the most fascinating way." I hope you can get your own copy. Planning to be on Long Island this weekend? Stop by and say hello to some Patheosians! I'm excited to announce a new project I've started for the Year of Faith called, "Catholic Moms Talk." Take a look (in the link below) at the many wonderful contributors listed in the left hand column. My hope and prayer is to bring the reader guidance and inspiration regarding studying the Catechism of the Catholic Church (which Pope Benedict has asked us to do during this year), as well as mothering tips, and discussions of mothering issues. Please join us there, feel free to leave comments and spread the word!